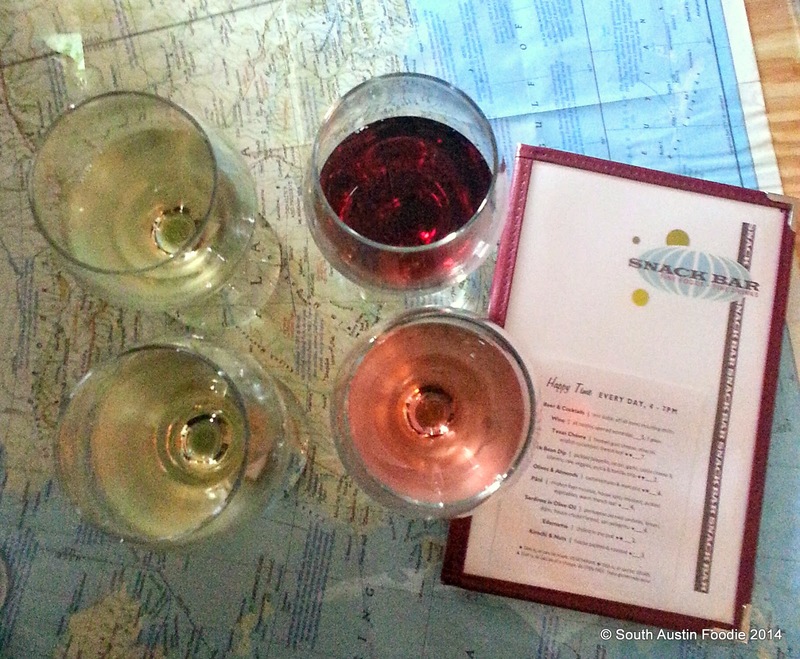 I was invited by Snack Bar to come and check out their new wine menu, and it ended up being a thoroughly enjoyable evening with owner Bethany Andree and Wine for the People consultant Rae Wilson. My friend and I selected a couple items to eat, and Rae picked four different wines to go with them. We had the lightly caramelized Brussels sprouts, which by themselves are a nice sweet and savory mouthful, but the addition of an herbed aioli adds another textural and flavor component. 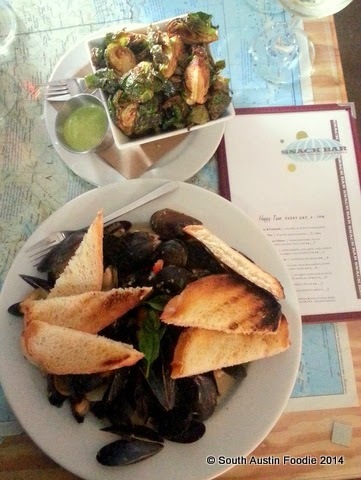 And the mussels, with their briny sweetness... what wines DO you pair with Brussels and mussels? Rae picked four wines for us to try, and they all really worked! I should have taken more wine tasting notes, but all complemented the dishes very well. 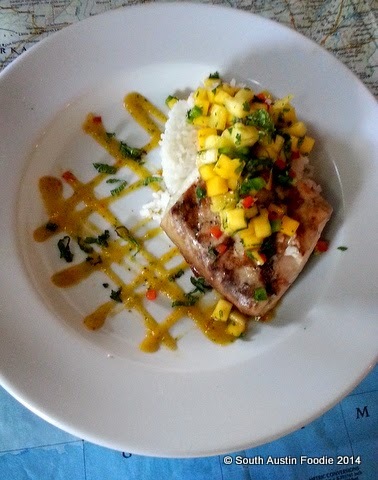 She also ordered the fish of the day, grilled mahi mahi with mango pineapple salsa and coconut rice. Not only did this look fabulous, it tasted fabulous as well! And of course, her wine selections worked great with this dish. So whether you're into reds, whites, or roses, Snack Bar can match your food and wine choices! Rae does wine consulting for a number of area restaurants, which includes staff trainings. With nearly 20 years experience in the industry, she aims to keep wines accessible to people of varying wine experiences. Bethany and her husband have owned and operated Snack Bar since 2009. She had worked next door at the Austin Motel for years, and when the space became available, they decided to go for it, and reclaim some of its vintage diner character. The menu reflects their love of travel and international cuisine, and there's something for everyone on it. 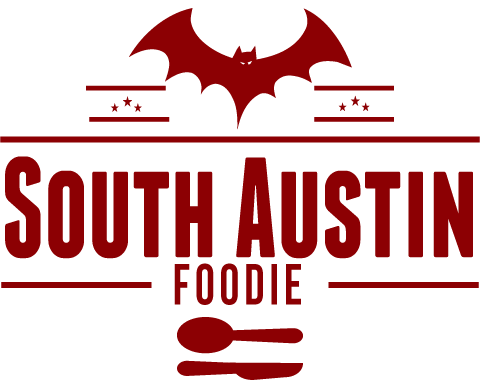 Being right in the heart of South Congress, they get a good mix of both locals, regulars and tourists. Their nice big patio is also perfect for people watching with a big glass of wine or beverage of choice. 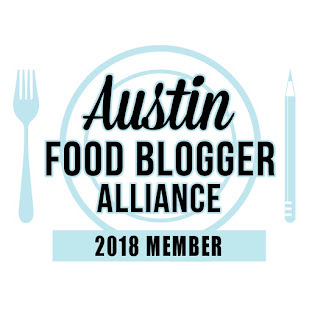 Check their website or Facebook page for nightly specials, but most importantly, go check out this fun South Austin spot! I was a guest of Snack Bar; no money exchanged hands, and I was not paid for my opinions.